I’m in love. The Vers 1Q is a smallish, cube speaker. It costs $119 and its simplicity is the biggest draw. 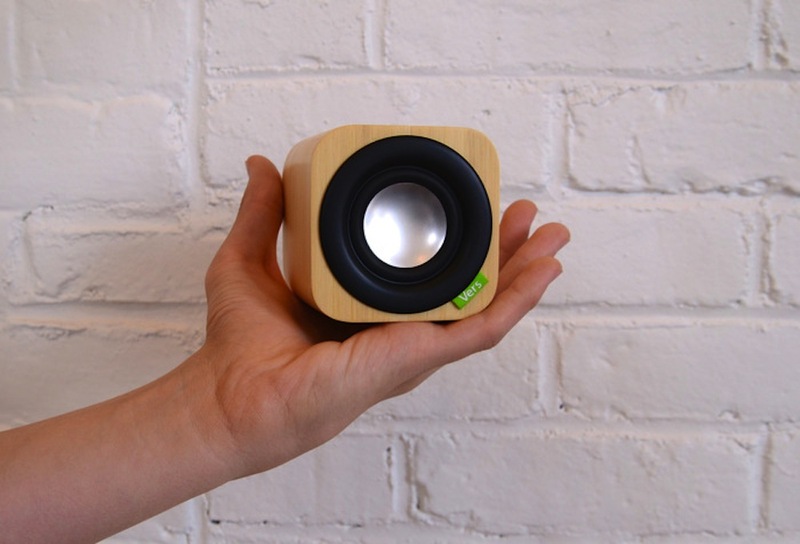 With a single speaker and easy connectivity, this little speaker easily fits into anyone’s life. Plus, much to my surprise, it actually sounds pretty damn good. … simply put, a speaker is the sum of its parts. There isn’t a magic ingredient. The formula involves the combination of speaker, amplifier and volume/density of the cabinet. This is where the Vers 1Q wins. The 1Q employs a quality, single driver inside a wooden casing with a good amount of volume. The 2-inch speaker easily handles the mid-range wonderfully and is a tad bright with the highs. Surprisingly, there’s a touch of bass from the 1Q, likely due to the ported cabinet. This mono setup, while seemingly rudimentary, is far superior than using two smaller speakers. The single speaker in the 1Q more than holds its own, and, in a small space like a bedroom or cubical, the audio is pleasantly loud and mostly accurate. … success story. Launched on the crowdsourced site in July, the company experienced a huge demand, acquiring $194k in preorders, although they were only looking for $10k. And now, just several months later, the company is preparing to ship the 1Q. It helps that Vers is not new at the hardware game. The company has been building and shipping clever iOS device accessories for some time now. Want something a little more multifunctional than the 1Q? Look at the Vers 1.5R, a fantastic-looking radio and alarm with a top-mounted Dock Connector port. … for nearly anyone. At $119 it’s rather affordable but more importantly, very unique. The 1Q is not the traditional plastic nonsense sold by big box electronic stores. A fallen rap star is not endorsing the 1Q. The casing is made of wood and available in several different finishes. It sports Bluetooth connectivity but also a 3.5mm jack and comes with a cable. Don’t worry about pairing the speaker with your phone. Just plug-in the cable and rock out. The 1Q even features a 3.5mm out which can be used to string together another 1Q, forcing the two speakers into a stereo mode with each speaker representing a different channel. A ton of inexpressive portable speakers are available. It’s a crowded market but the 1Q stands above most with a great design and sound.